After last week's shocking revelation that there is a new Kira Nerys in Favor the Bold, I hope you're prepared for this week's news. One of the cards in Favor the Bold has the same title as the previous expansion! Amazing! That means there will be a card in Favor the Bold called The Undiscovered Country! Okay, sarcasm doesn't translate that well into a news article, does it? 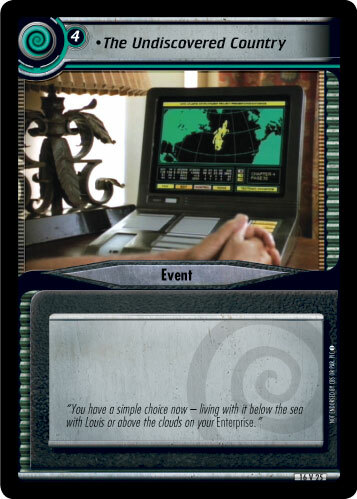 Regardless, there is a card called The Undiscovered Country in expansion #16 - your job is to figure out what it does! Two people that can correctly guess what game text appears on this card will win a shiny Chula: The Dice foil! Each player searches his or her dilemma pile for a Consume dilemma, sets that dilemma aside, shuffles and replaces his or her dilemma pile, and places that dilemma on the top of its owner’s dilemma pile. Each opponent that cannot place a Consume dilemma like this, removes the top four cards of his or her dilemma pile from the game. Destroy this event. Plays in your core. When a personnel that the player on your right commands begins a mission attempt, before you have drawn dilemmas, you may destroy this event to name a personnel. Each opponent’s personnel with that card title is stopped. Plays in your core. When an opponent plays a card with V rarity, you may discard a card from hand to download a card with V rarity. Plays in your core. When you reveal a Consume dilemma from your dilemma stack, you may take two Consume dilemmas from beneath one of your opponent’s missions and return them to their owner’s dilemma pile. You may do this only once each turn. To play this event, you must command three personnel. Plays in your core. While a player's personnel is facing a dilemma, that personnel's owner may reveal a copy of that personnel from hand to make that personnel attributes +1 until the end of that dilemma. To enter, send in your guess about the correct gametext for the event to contests@trekcc.org before MIDNIGHT GMT-5 on WEDNESDAY, JULY 30TH. Do not include anything but your real name, your email address, and your guess. Designers, developers, testers, and anyone else with foreknowledge of the contents of Favor the Bold are not eligible. Good luck, and look for more contests like this in the near future!